Shooting Star (Dodecatheon meadia) is an herbaceous perennial named for the shape of its flowers and the flowers’ curved stems, which together look a bit like a shooting star with a tail following it through the sky. 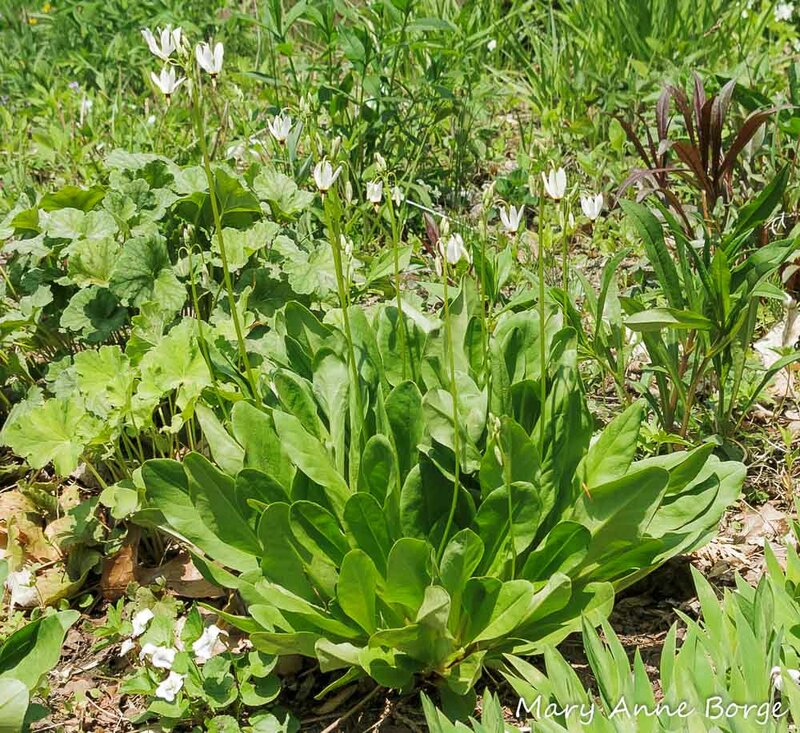 Shooting Star blooms in spring over a period of several weeks. 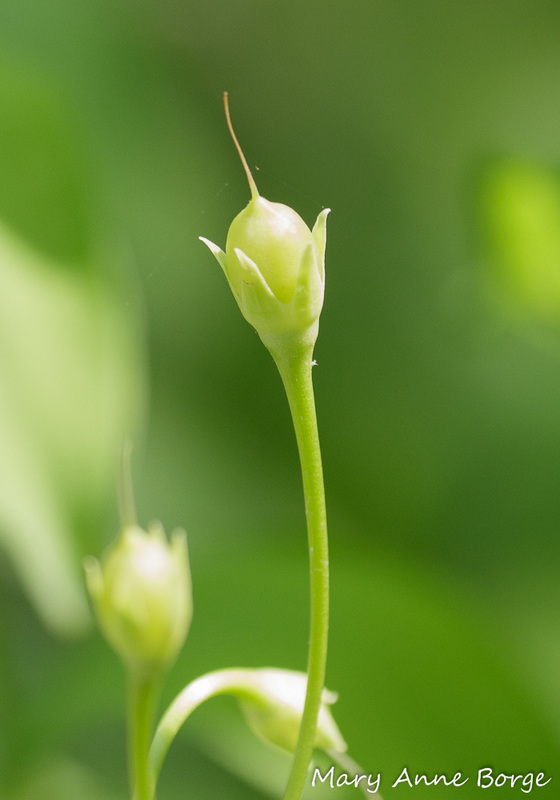 Each flower shoot produces multiple flowers, each flower with its own curved stem (or tail). The flowers can be white or pink. If the flowers are pollinated, fruit capsules take their place and along with the leaves remain visible for many weeks in the summer. Shooting Star requires a partner with special skill to help achieve successful pollination, an insect with the athletic ability to hang from below the flower and vibrate its wing muscles without moving its wings, in order to shake pollen loose from the flower. This is called buzz pollination, because the vibration makes a buzzing sound. 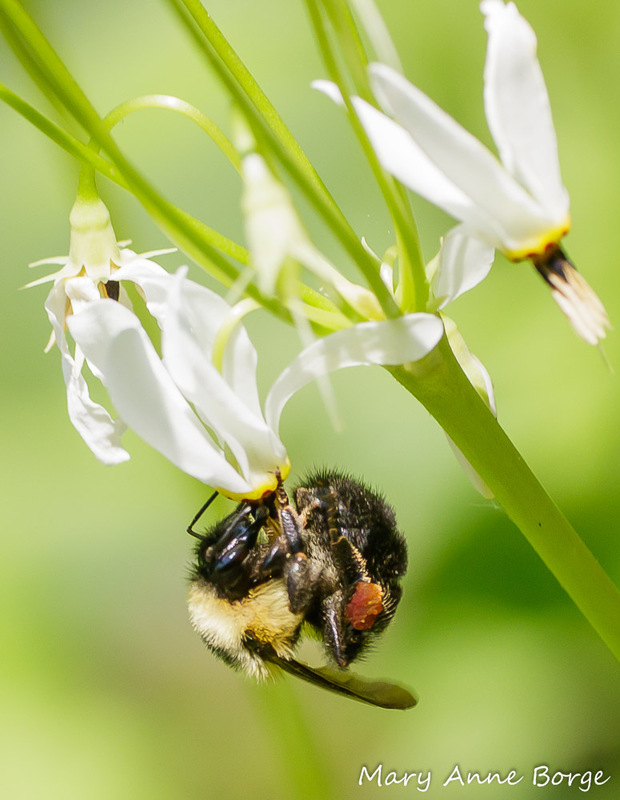 Queen Bumble Bees have this ability, and they are the perfect unsuspecting collaborator in Shooting Star’s pollination. 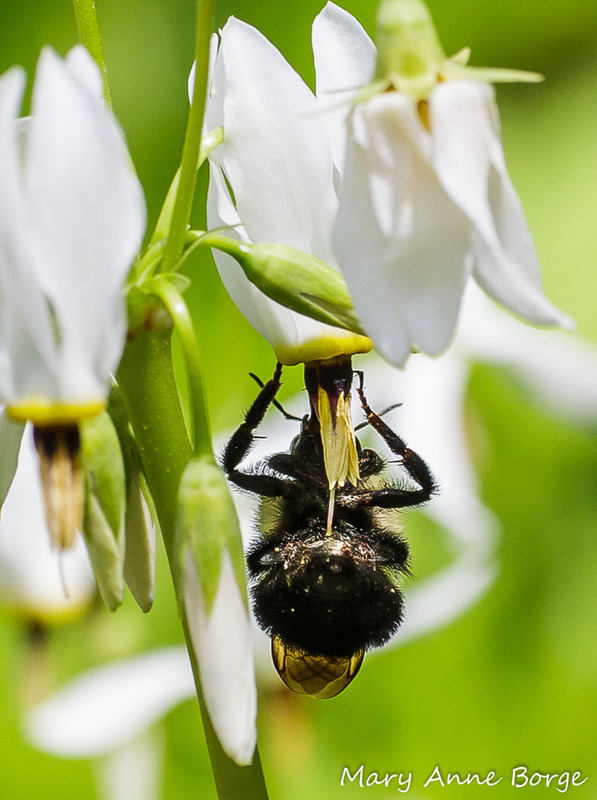 When a female Bumble Bee like the one shown here clings to a Shooting Star flower from below, her abdomen touches the plant’s stigma, the place on the pistil (female reproductive part) where pollen must be deposited if pollination is to take place. If pollen is present on the bee when she arrives at a flower, it will be brushed from her abdomen onto the flower’s stigma, possibly with some assistance from static electriciy. As the Bumble Bee clings to the flower she vibrates it, causing a dusting of pollen to be releases onto her abdomen. She then carries the pollen to the next flower she visits. Queen Bumble Bee on Shooting Star (Dodecatheon meadia). The flower’s stigma is touching the bee’s abdomen. Notice the dusting of pollen that is beginning to accumulate. Honey bees don’t have this special skill. Only native bees like Bumble Bees and some others are able to buzz pollinate. Blueberries, cranberries, tomatoes, eggplants and peppers also require buzz pollination. If we didn’t have these bees, we wouldn’t have this food! Shooting Star doesn’t produce nectar, so why would bees keep visiting these flowers? They don’t do it altruistically, they need some incentive. Bees visit the flowers for pollen, a food source high in the protein and lipids bees need. After she has visited enough flowers, the Bumble Bee will groom herself, eating some of the pollen and storing the rest on her legs to carry back to her nest to feed her larvae. Queen Bumble Bee on Shooting Star (Dodecatheon meadia). She has collected pollen on her rear legs to take back to her nest to feed her larvae. Other small bees may visit the flowers to harvest pollen, but because of the way these smaller bees handle the flowers, the chances are lower that they will encounter the stigma and deposit pollen. Shooting Star is native in Manitoba in Canada, and much of the eastern half of the United States except the New England states, New Jersey and Delaware. It is most commonly found in some of the mid-western states. 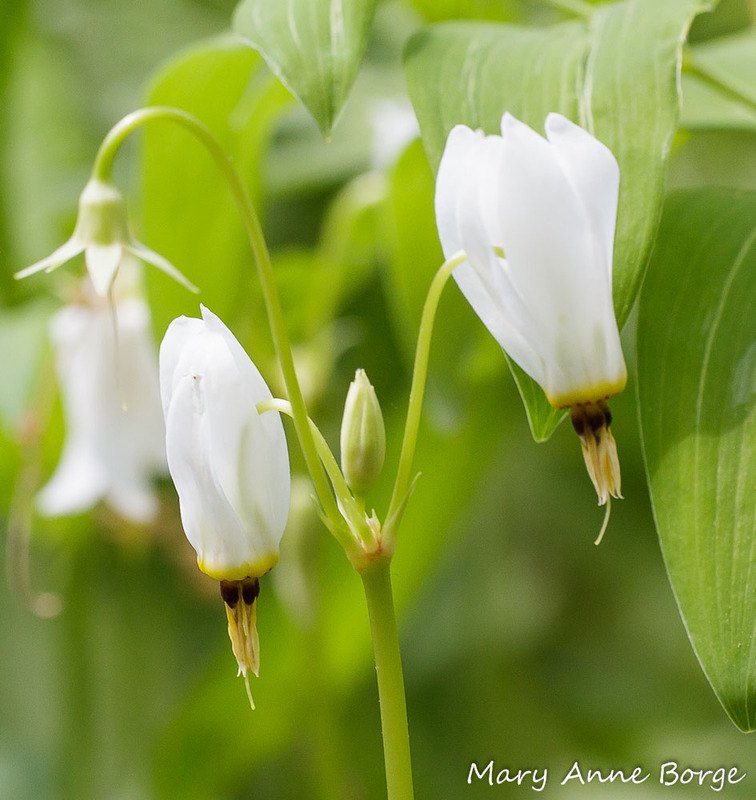 Shooting Star likes shade to part shade and can be found in open woods. Spira, Timothy A. Wildflowers & Plant Communities of the Southern Appalachian Mountains & Piedmont. 2011. 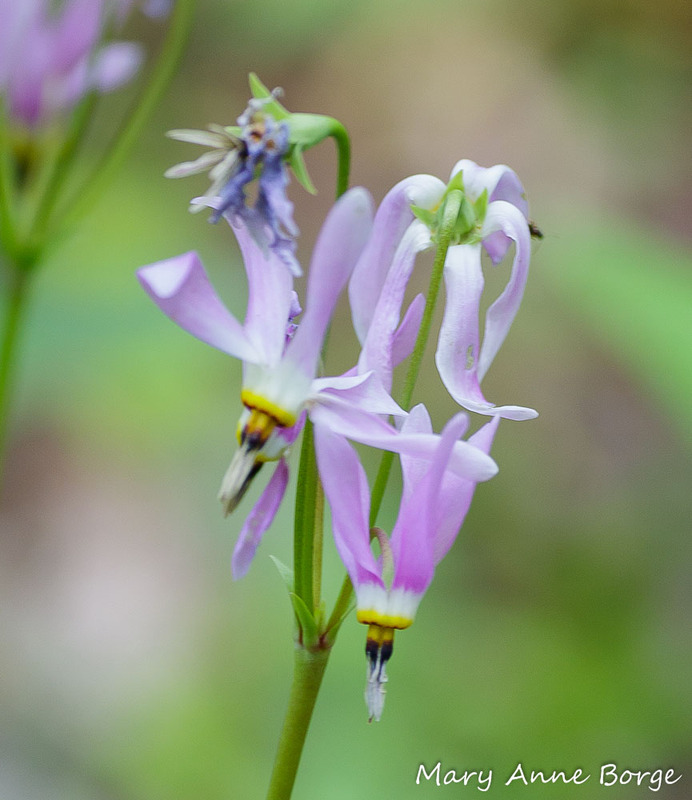 This entry was posted in Native Plants, Nature, Other Insects and Spiders and tagged Buzz pollination, Dodecatheon meadia, nature, Shooting Star by Mary Anne Borge. Bookmark the permalink. I was staring at some shooting stars in my part of the world and wondering about who pollinates them. I figured they had to put in some serious work to get it done and I was right! Thanks for sharing your knowledge! I’m glad you found the information helpful! I have been enjoying my shooting star from Bowman’s and love getting to read this post. I can’t wait to see if we get any fruit capsules. Let me know if you get fruit! I found a fruit capsule! This is so exciting. 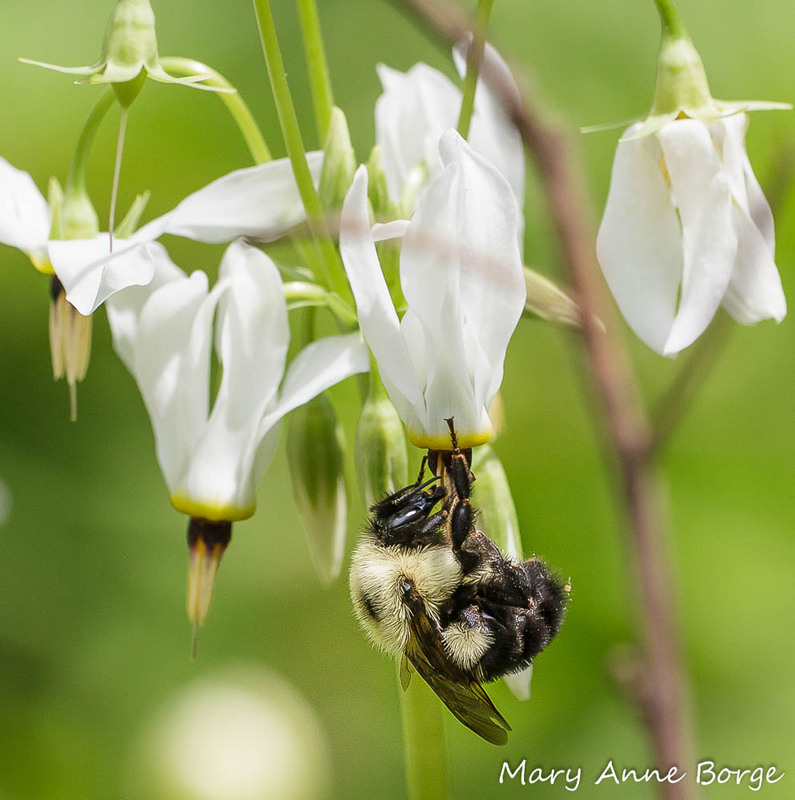 Thank you for the wonderful description & example of buzz pollination and for the exquisite photos. Such beautiful pictures and very interesting information! Great post! I wish you beautiful Pentecost! Thank you! The same to you! Thanks! I see we have a lot in common. The content of this blog is copyrighted. For permission to use articles or photographs, Contact Me.